Put a large quantity of salted water in a pan to boil. In a dry pan, toast the pine nuts until golden. Put three quarters of the basil leaves into a pestle and mortar, add the garlic and half the pine nuts and mash to a green paste. 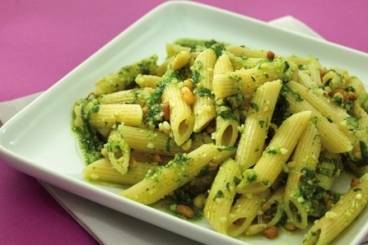 Gradually add the parmesan and the oil and then fold in the remaining pine nuts and refrigerate. Finely chop the rest of the basil leaves. Cook the pasta until "al dente" (pasta should still be firm), cool under running water and drain well. Add the pesto and the chopped basil. Season with salt and pepper and serve cold.